It was a crisp Saturday morning in South Cairo, New York at the Tiny House Resort. 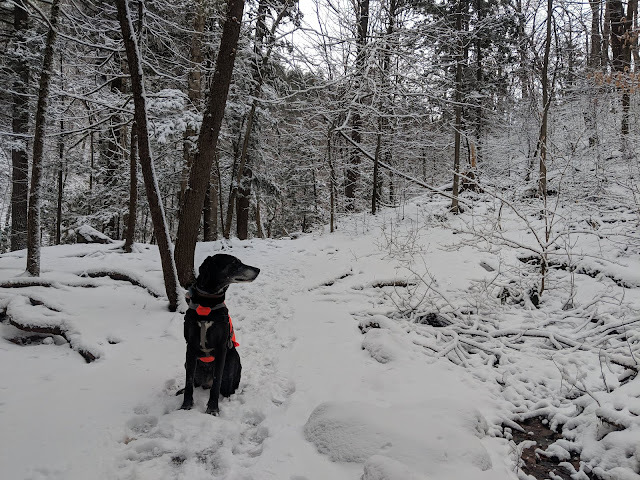 As I opened the shade of "The Mocha" with a full day open for hiking and adventures in the Catskills, I saw a fresh coating of snow covering the ground. Just an inch or two down at the resort but I knew the mountains would have a thicker coating of snow at higher elevations. So early Saturday morning after making coffee and walking around the resort with the dogs, we packed our bags for a morning hike. 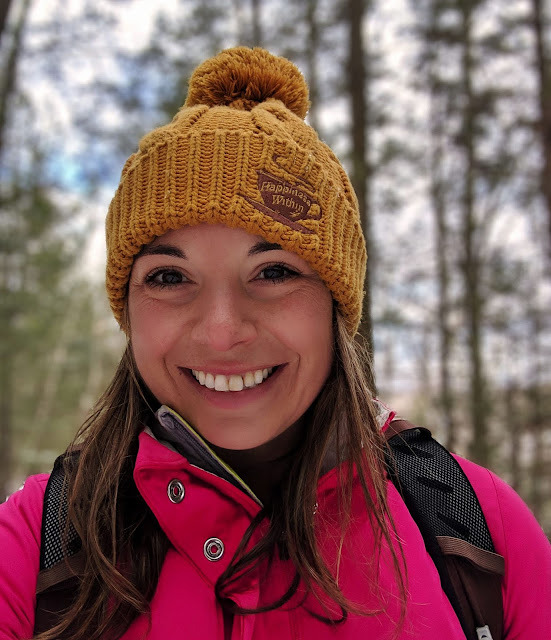 I wasn't sure how much snow there was in the mountains so I decided an easy trip up to one of New York's most famous waterfalls would be the perfect way to start the weekend. 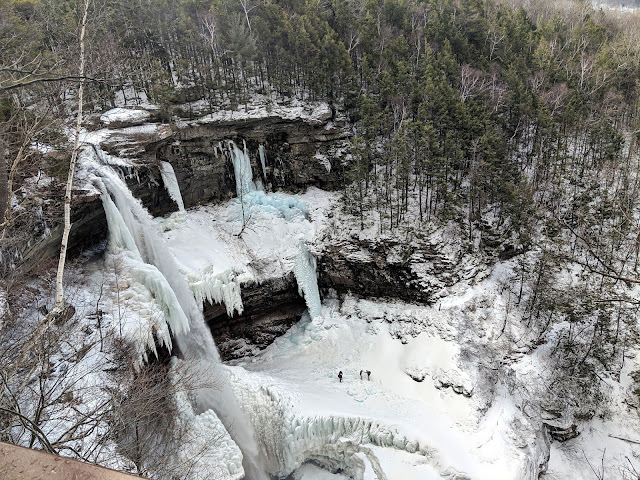 Kaaterskill Falls is one of the Catskills most famous and frequented destinations. 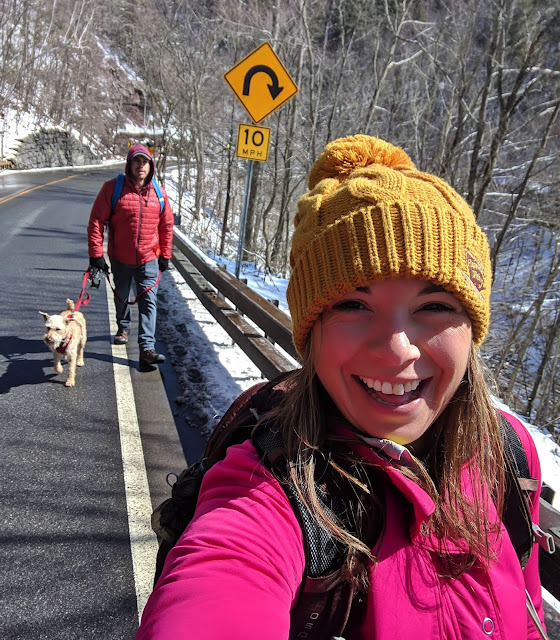 It is just a mile(ish) hike off of Route 23A making it an easy trip to one of the highest waterfalls in New York. A three-mile hike will take you from the parking lot, to the base of the falls, up to a viewing platform above the falls and back. A trek to this two-stage waterfall which cascades 260 feet is referred to as one of America's "oldest tourist attractions" and standing at the base of the falls or on the platform above it's easy to see why. 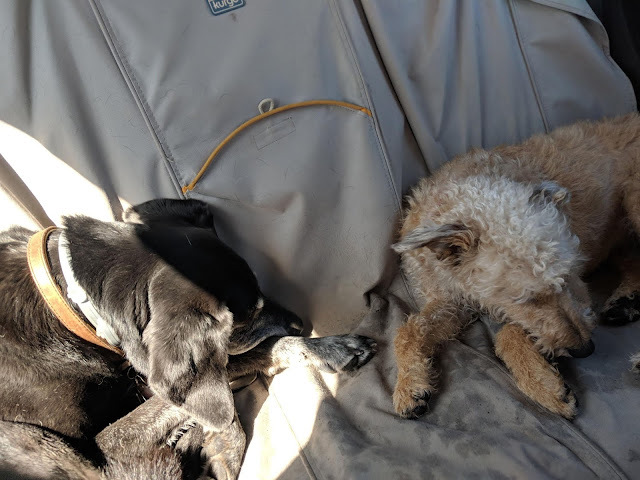 Just the drive to this area is beautiful as you wind along Route 23A and pass waterfalls and streams on a curving winding road. One of the best parts? It's an easy drive and easily accessible from the Connecticut shoreline. 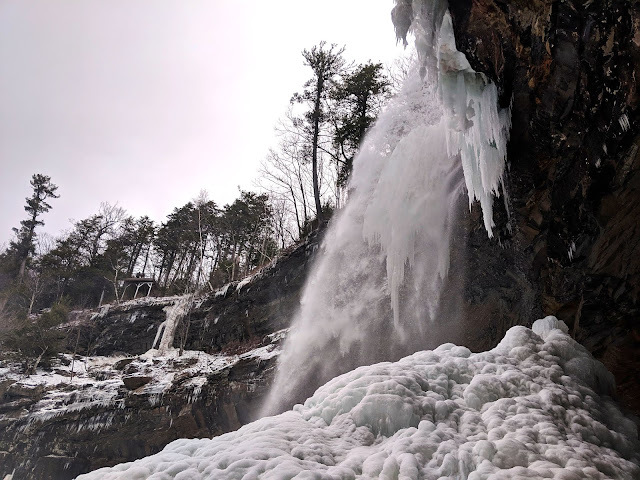 In just under three hours, you can be leaving Guilford, Connecticut and at the trailhead in Haines Falls, New York to see this impressive waterfall. 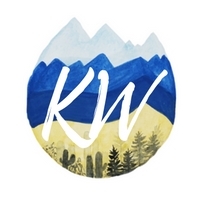 Because it is such a famous attraction, this is one of those hikes that is best to do early in the morning, on a weekday, or in the off-season (or a combination of all three if you really hate crowds). We were on the trail by 8:30 am on a Saturday morning in March and only saw a few people on the trail. By the time we got back to our car later in the day, the parking lot was full and crowds of people were making their way to the trailhead. Early bird gets the worm. Or, er, the waterfall to themselves. 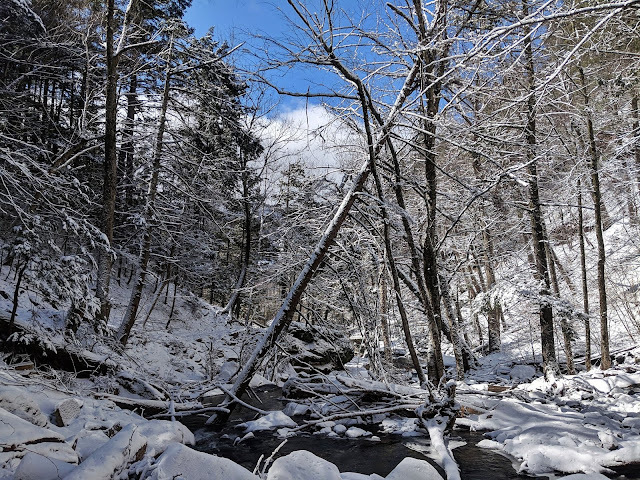 While I am sure this waterfall is a sight in the summer and I already have plans to go back and find out, there was something so beautiful about having the place to ourselves and seeing this waterfall in a winter wonderland. 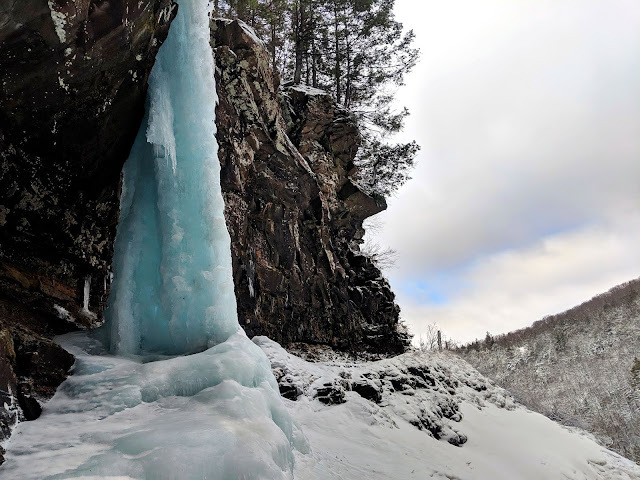 Frozen waterfalls, blue ice, and mounds of snow. This is Elsa territory if you know what I mean. 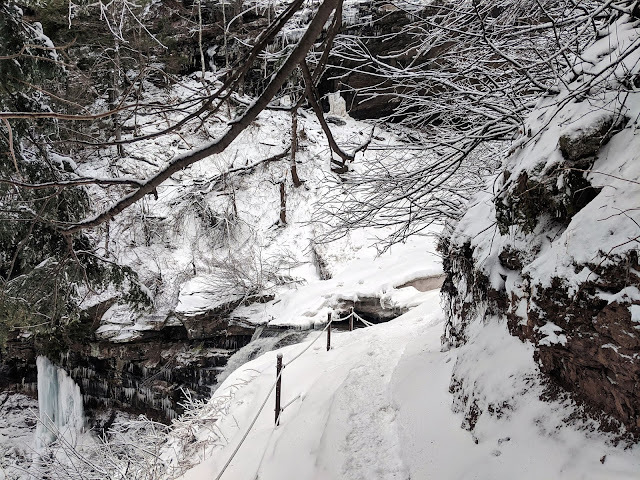 The spray from the waterfall makes for some pretty cool features in the area and the waterfall plummets off the snow-covered rock into the iced areas below. 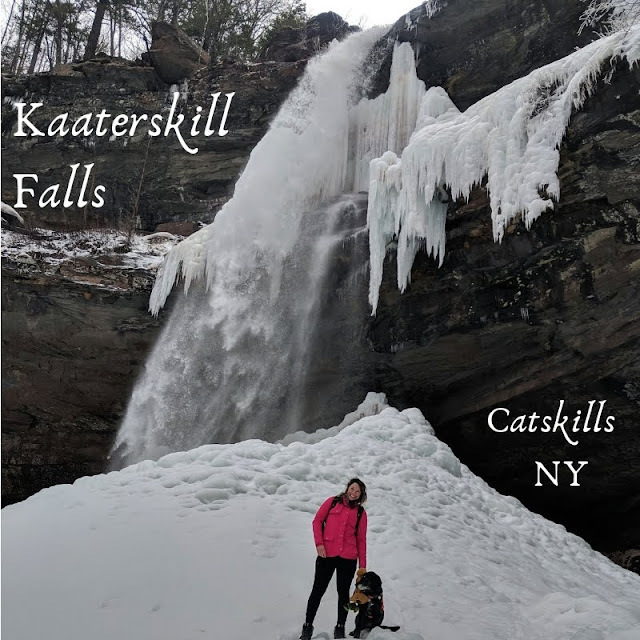 You can even walk behind the waterfall, standing next to the colossal rock face, amazed the Catskills are so damn beautiful and so close to home. 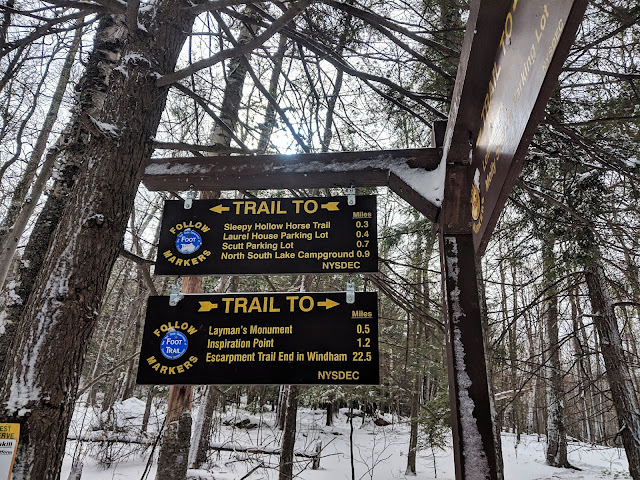 We parked at the trailhead, made the treacherous walk down Route 23A (all in "Need To Know" below) and found ourselves at the beautiful roadside Bastion Falls which also marked the start of the trail. From here, we followed the well-marked yellow trail along Spruce Creek until we finally reached the base of the falls. 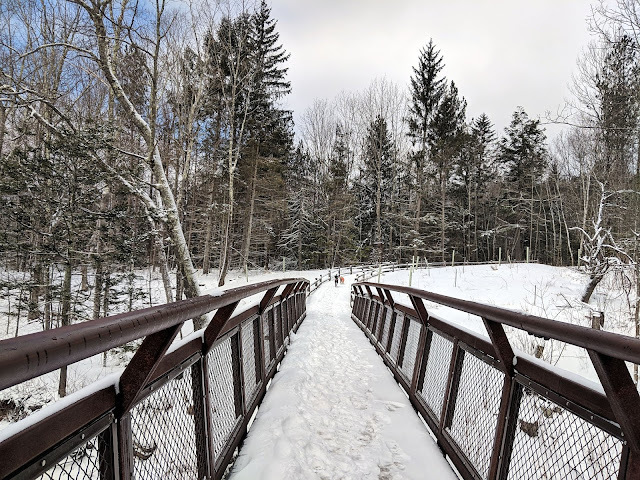 There were a whole ton of "ooo's" and "ahh's" as we followed the stream and snowy trail in that perfect winter wonderland. The trail is relatively flat and we did not need our microspikes until the base of the falls where you absolutely 100 percent need them to continue on this trail. 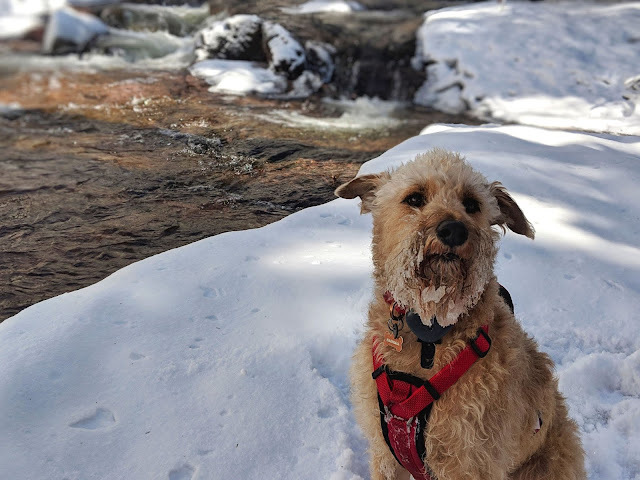 We were both pretty impressed by this massive cascading waterfall, those icy blue frozen structures and the overall beauty of the area. 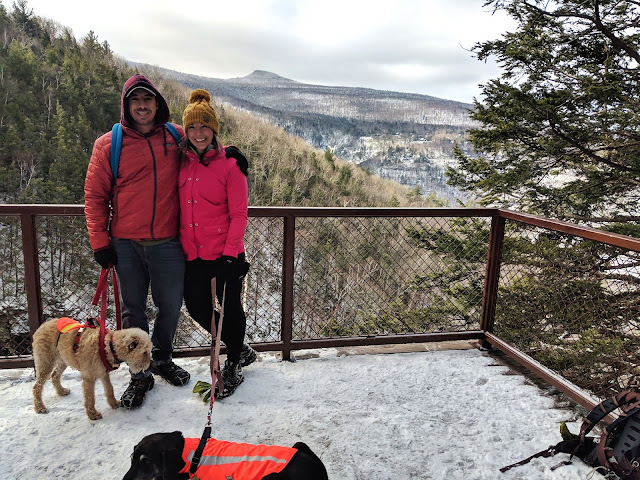 Adam was in awe, the dogs were happy, and we only had to share the waterfall with one kind older gentleman named Mike who took some out of focus/heads chopped off photos before we continued on up the yellow trail to the viewing platform above. 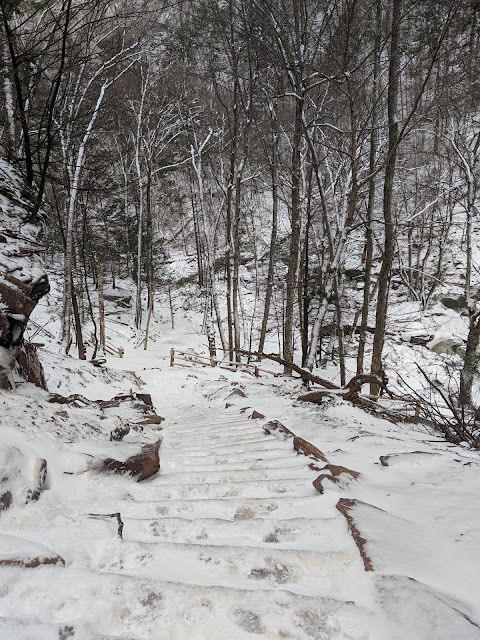 To get to the viewing platform, the trail climbs a set of ice and snow covered STEEP stairs (microspikes and crawling on all fours required) before leveling out and slowly climbing to the upper viewing area. 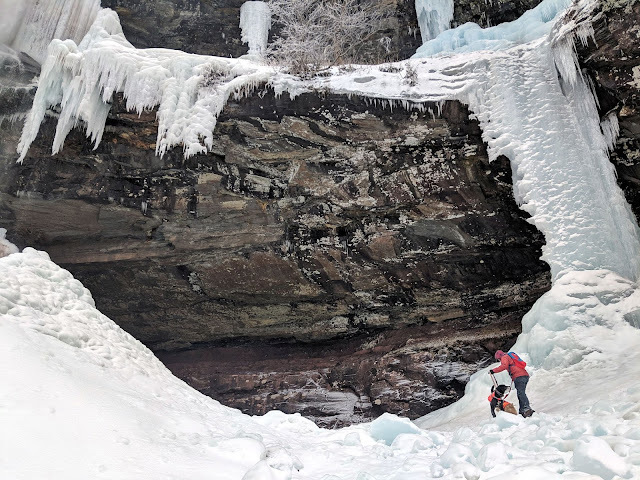 Parking: Parking for Kaaterskill (from the base) is off Route 23 about 1/4 mile past the Kaaterskill Falls trailhead (at the base of Bastion Falls). 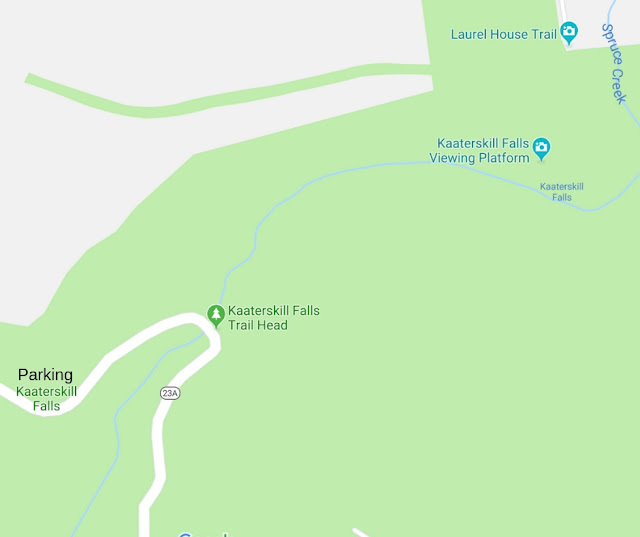 Space here is limited and parking here requires walking down busy Route 23A (no sidewalk, barely any shoulder) to the beginning of the Kaaterskill Trail. The road is winding, very narrow and the speed limit is a mere suggestion to speeding tourists. 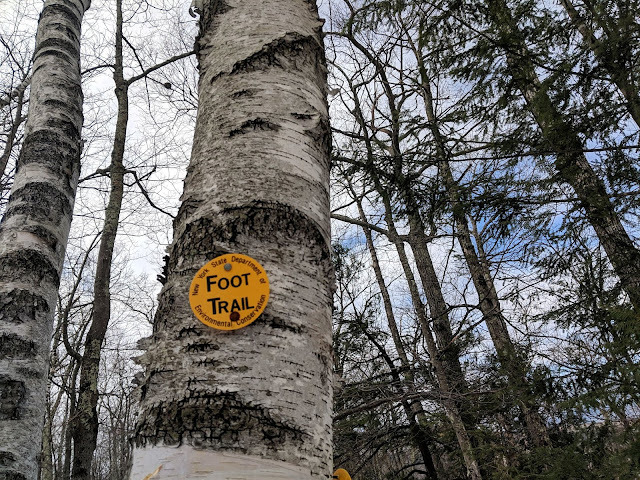 Trail: From the trailhead off Route 23A (at the base of Bastion Falls at the hairpin turn in the road), follow the yellow trail along Spruce Creek to the base of Kaaterskill Falls. At the base of the falls, continue up the stairs and keep following the yellow trail until you reach the upper area. From here, you will cross the bridge and follow the signs for the Observation Platform. 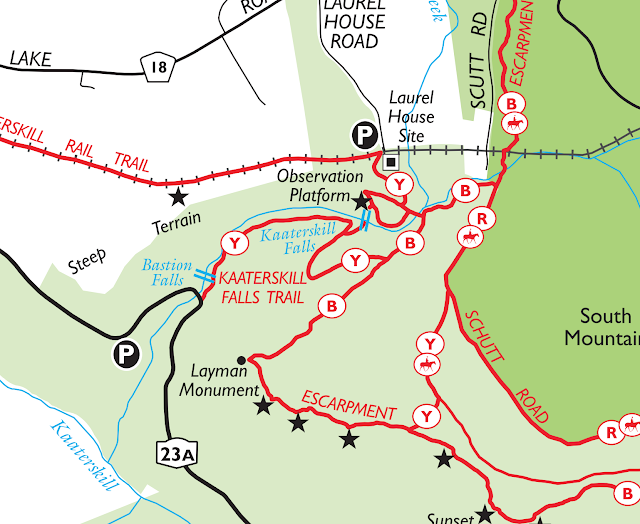 From here, you have a great view of the falls from above Trail Map. ** There are several other ways to get to the falls. You can park at Laurel House Road and hike down to the base of the falls (or just 0.2 miles to the viewing platform) and then continue down. Distance: 3 miles RT (from the parking lot, walking down 23A, to the base of the falls, up to the observation platform, and back). 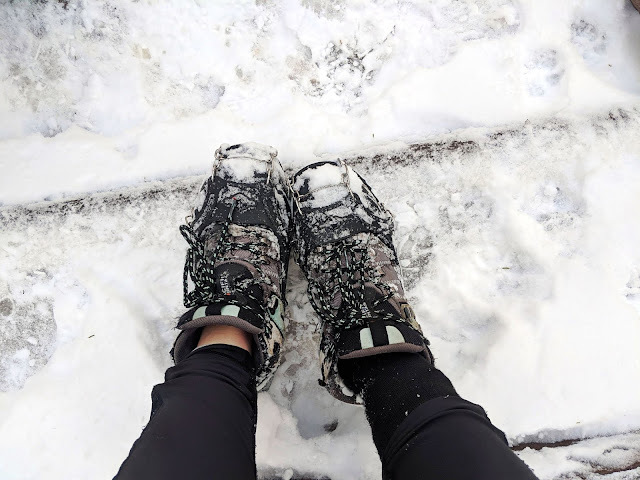 Extras: If you are hiking this trail in the winter (like we did) microspikes are a must. The trail and stairs are steep and icy in parts and it will be impossible to get up and down these steep areas without them. Danger: There have been a number of deaths at the falls due to hikers and photo enthusiasts getting too close to the falls for a photo. As the falls have increased in popularity so has the number of hikers who have visited the falls. The short trail length also opens up the trail to a lot of different user groups. While the exposed areas are roped off, some people feel that the rules to do not apply to them. Throw in steep clifs with slick mossy areas and you can see how accidents can happen here. Stay within the trail bounds and respect mother nature. 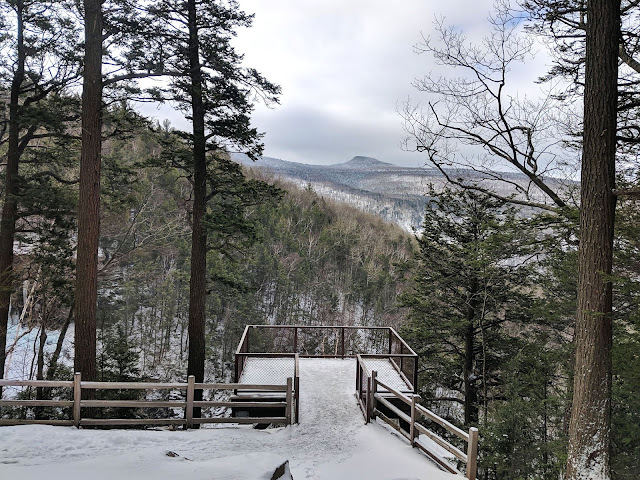 From the viewing platform, you have a spectacular view of the Hudson Valley, the ice-covered waterfall and the woods below. It is the perfect place for a photo op, to take in the view, and be thankful that beautiful places like this exist so close to home. 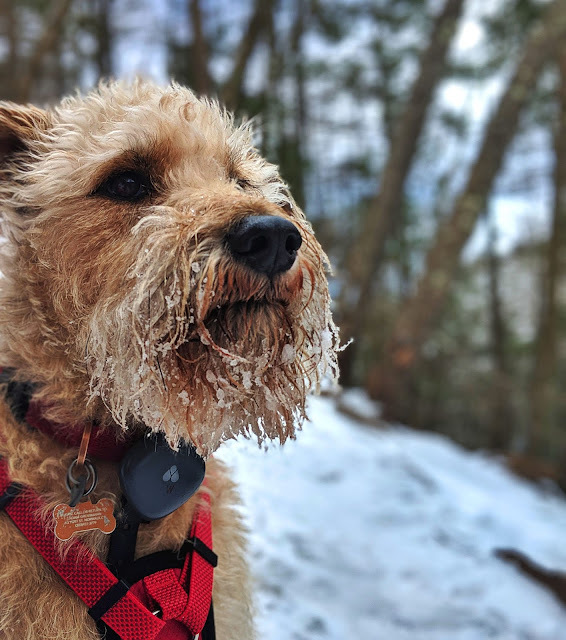 Relatively easy hike in a frozen landscape with the best of company - two happy dogs included. This trip was such a great reminder that there are so many beautiful places so close to home and that surrounding yourself with good people goes a long way. 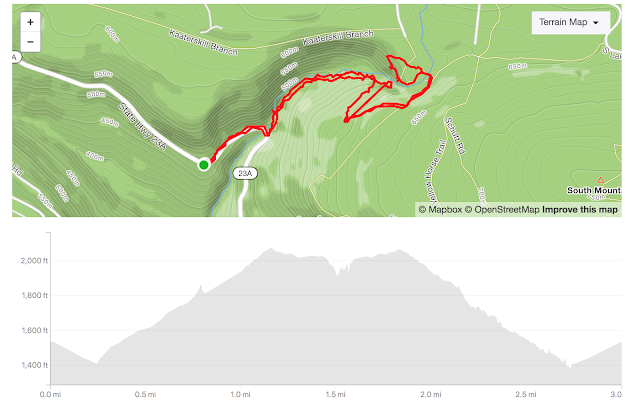 Check back in for my post on Sunday, our hike around North-South Lake to Newman's Ledge.